I LOVE a good biscuit. I have these ideals of southern women and their biscuit making. There is nothing like walking into a good southern restaurant and ordering a light, fluffy biscuit. I want my home to be just like that. You can imagine my surprise when I asked my Texan grandmother how she makes biscuits and she said she doesn't make them. She insisted that Pillsbury frozen biscuits are just as good as homemade. Personally, I just don't buy it. I have played with tons of recipes and have several favorites. 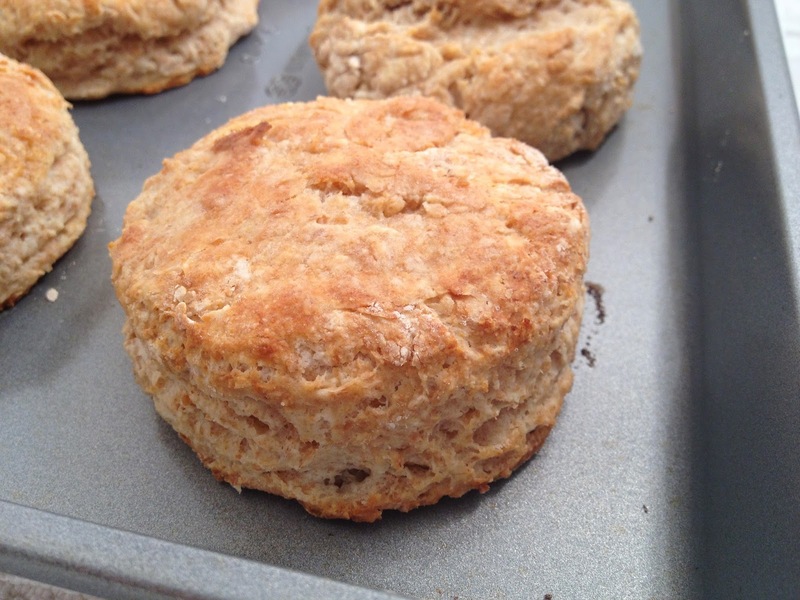 You may have seen my favorite sweet potato biscuits, which are an excellent brunch treat. 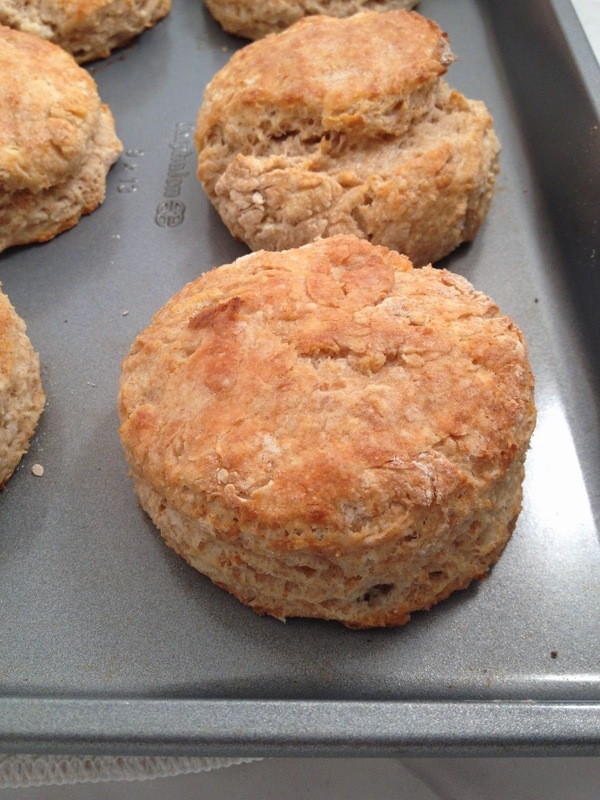 On days when I want something a little quicker or simpler, I make these whole wheat biscuits. They are flavorful, hearty, but still light. When I am feeling like I want something a little cleaner, I increase the wheat flour and decrease the white flour. The higher the wheat to white ratio, the less the biscuits rise, generally. This recipe seems to rise very well, even with the high wheat flour content. 1 cup of low fat buttermilk OR 1/2 cup of greek yogurt and 1/2 cup of milk. Preheat oven to 425*. Combine the flours, baking powder, salt and sugar. Cut cold butter into small pieces and mash into the flour mixture with two forks. If you have a pastry cutter, use that. I just stick with the forks! Once the butter is blended into small clumps in the flour (about the size of small peas), slowly add the buttermilk. DO NOT STIR LIKE CRAZY. Slowly fold the milk in. The dough may seem a little dry, that is okay. I find just a few stirs blends the dough enough. The less you play with the dough, the lighter your biscuits will turn out and the more then will rise. Gently turn the dough out onto a floured surface and knead dough gently - about 8-10 times is plenty. Pat dough out to about 1 inch thickness and cut out biscuits. I use a drinking glass to cut mine. 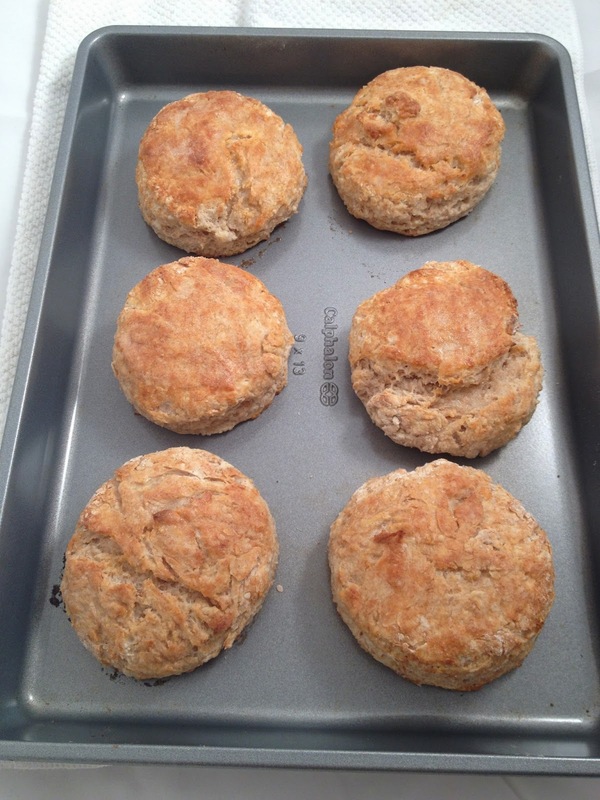 You should get about 6-7 biscuits, depending on the size. 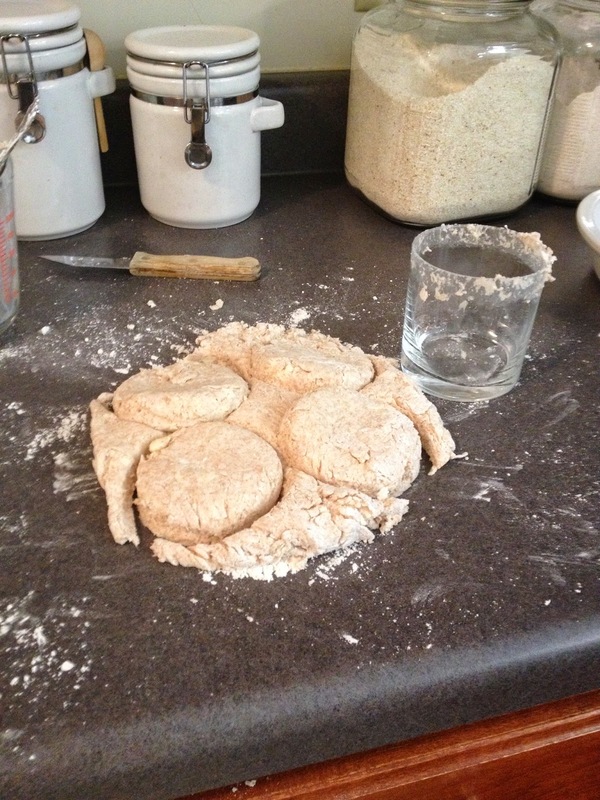 Place biscuits spaced out on an un-greased, non-stick pan. Don't let the biscuits touch, let them stand independently. Bake them at 435* for about 12-15 minutes and watch carefully. Once they look light brown, pull them out. I enjoy mine with jam, butter, and or honey. AR likes to make them into a sandwich with a fried egg. Any way you eat them, they are wonderful. How do you enjoy your biscuits? Do you make big brunches on the weekend, or go out? Golly, those looks sooo good. I try to eat gluen free, so I wonder if I could sub the all-purpose flour with specially made Gluten Free Flour.